Because we all need reminders! Ellie has had so many colds and infections since the start of cold and flu season. It seems we just can't get back to normal. I've decided I'm posting reminders for everyone who cares for Ellie because her safety is too important to overlook even the simplest rules. Hand hygiene is super duper important! It doesn't matter if you're wearing gloves to care for someone if you've scratched an itch or adjusted your clothing. If you've touched anything you've likely already contaminated your gloves with some kind of bug that should be inside a trach. 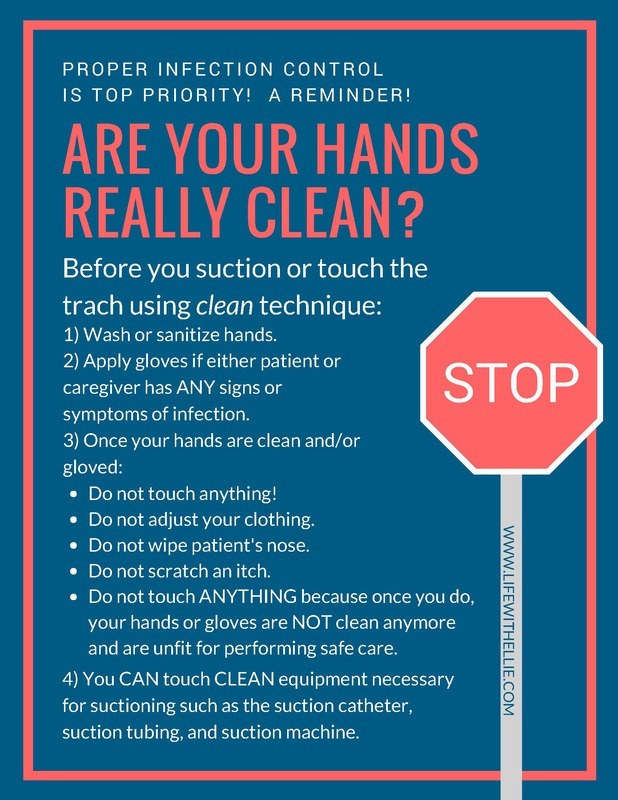 If you've just washed or sanitized and you wipe your patient's snot, your hands are no longer clean enough to do proper/clean trach care or suctioning. This is basic but it's really amazing how many times I catch people doing these things without realizing they've even done it. When in the hospital, I frequently see hospital staff answer their phones or pagers with gloved hands while in Ellie's room. EVERYTIME I ask them to please wash and reapply clean gloves. ONE time I didn't do this and I feel guilty to this day because that was the admission Ellie picked up Klebsiella on her second culture after being inpatient. 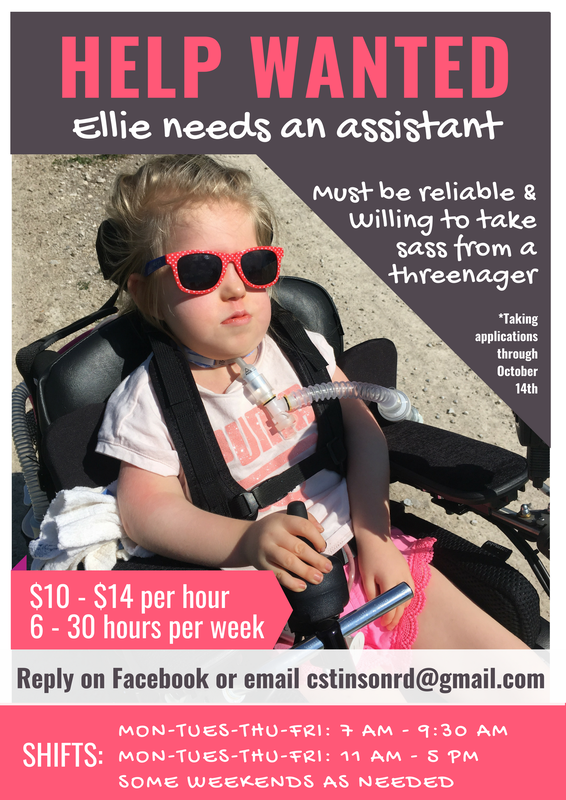 I am Ellie's #1 advocate and if I don't protect her from even well-meaning caregivers then I'm not doing my job well enough to keep her well. I can't sit idle or be shy because someone with more training in trach care or medicine isn't following basic hand hygiene rules. The following sign is now posted in Ellie's bedroom as a reminder for all of us at home. I hope it helps and I hope she stops getting sick! Enough of this crud already! Are you a trach parent living the #TrachLyfe? What else do you do to protect your precious loved ones? Please share! 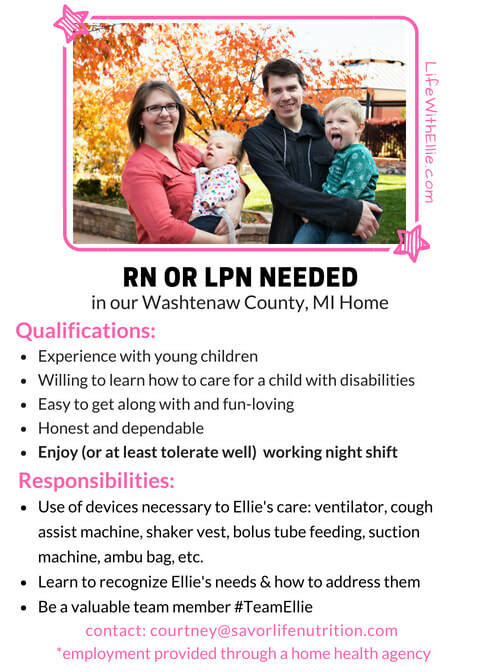 Feel free to download and print or share this flyer. I hope it can help someone else prevent an illness and hospital admission! It's hard to believe Ellie is 3-years-old already. It's hard to believe we've been living life with a mini emergency room that travels with Ellie everywhere she goes including from room-to-room in the house and to the backyard to play for almost 3 years. It's hard to believe we've given up privacy and quiet family time to welcome help and nurses into our home and our family for 3 years. To be honest, I wasn't looking foward to this day. I was afraid of dealing with my mind swirling with the excruciatingly painful images and emotions of Ellie's first day and week of life. It was a really dark place for me. I was afraid too because I recently went off my anti anxiety/anti depressant medication that I was prescribed in the first week of Ellie's life for "situational depression". I wasn't sure I'd be able to handle today without it. I'm happy to say, today has actually been okay. I think the happy memories and experiences finally outweigh the sad. We've had so much to celebrate and so many little milestones that it's almost hard to believe Ellie was as fragile as she was. Ellie saw her first theater performance. Pete The Cat at the State Theater. Ellie started outpatient Physical Therapy. We visited a butterfly exhibit at the Natural History Museum. We played laser tag as a family for Aunt Kristen's birthday and Ellie had a blast. We moved Ellie into her bedroom and out of the living room. This was a BIG step! I (Courtney) took 3 work trips and flew on an airplane out of state. Two of those trips were for 5 nights away. Ellie went swimming at recreational therapy. Ellie jumped on the trampoline that we got for our indoor porch. With help of course. Aunt Courtney survived taking Nathan ans his two cousins to the store by herself. We went to Top of the Park and Ellie tried cotton candy and caught a firefly. Ellie started speech therapy outpatient. We successfully had a blend made for Ellie at the mall. The sushi place made her a blend from rice and a smoothie we purchased. They were awesome. I took Ellie down the rolly slide... ouch. She loved it. Ellie went grocery shopping with us several times. She's a shopaholic. We got to be part of Shop With A Cop and it was an awesome experience. Ellie had her first teeth cleaning (a mini version). 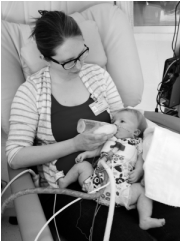 Ellie started the process of weaning off the ventilator and can go up to an hour without her ventilator on a good day. Ellie jumped in a bounce house at her Great Grandma's birthday celebration. Ellie had 3 hospital admissions and terrified her parents. She got a blood transfusion (PSA: DONATE BLOOD). Ellie started preschool. She LOVES it and wants to go everyday. Nathan and Jeff went tree climbing. We took Ellie on her first bike ride. She LOVES going fast! Ellie was a chicken and Nathan was a Zhu Zhu pet for Halloween. Ellie overcame her fear of bubbles. Ellie's Grandpa Doug learned how to do most of Ellie's care and spent many hours caring for her solo. Ellie's dad, Jeff, too care of her without me during an entire week-long hospital stay because I was also home sick and couldn't visit. Nice work Jeff! We finished the year with a homemade pasta making party with the cousins. Eli and Oliver had a sleepover. 3-year-old Ellie is going to accomplish so much more!